Elizabeth Layton was born in London and studied at the Yehudi Menuhin School and the Juilliard School, New York with Dorothy DeLay. At the age of twelve, she was invited to join Hephzibah and Yehudi Menuhin for a chamber music concert to celebrate the latter’s Golden Jubilee, broadcast from the Royal Festival Hall, London. Elizabeth made her UK concerto debut with the Philharmonia, also appearing as soloist with the BBC Symphony Orchestra, English Chamber Orchestra, London Mozart Players, Bournemouth Symphony, English Sinfonia, Calgary Philharmonic, City of Barcelona Symphony, Lahti Symphony and many others. Festival appearances include Bath, Edinburgh, Harrogate, Cheltenham, Valencia, Gstaad and numerous music societies. Chamber music has always featured prominently in her work, and after touring worldwide with the Nash Ensemble, she went on to record the complete piano trios of Beethoven (nominated for a Gramophone Award) and violin and piano works of Schubert (Daily Telegraph ‘CD Choice’). Other recordings include chamber music by Ravel, Schubert, Brahms, Faure and Shostakovich for DG, Hyperion, BIS and Chandos. Elizabeth was Associate Leader of the Academy of St Martin in the Fields, and later became Concertmaster of the BBC Scottish Symphony Orchestra. She regularly directed the orchestra from the violin, also guest directing the Scottish Ensemble, Manchester Camerata and Ambache Ensemble. A commitment to contemporary music has seen the BBC broadcast a number of solo performances, including a critically acclaimed CD of Jonathan Harvey’s ‘Scena’ with the BBC Scottish Symphony Orchestra under Ilan Volkov. Elizabeth moved to Australia with her family in 2010 and collaborates regularly with many leading musicians, including Selby&Friends and the Australian String Quartet. She broadcasts frequently for the ABC, appearing recently in recital for Sunday Live and as soloist in Raymond Hanson’s Violin Concerto with the Adelaide Symphony Orchestra. A regular guest Concertmaster with leading orchestras in Australia and New Zealand, she has given many recitals in Adelaide, Melbourne and Canberra. 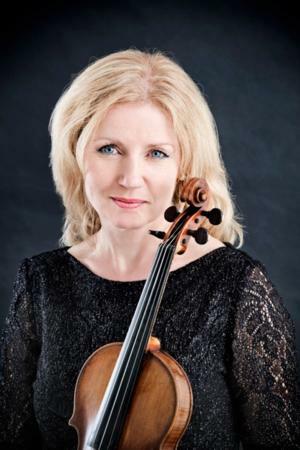 Elizabeth is Senior Lecturer in violin and Head of Strings at the Elder Conservatorium, University of Adelaide.